*Enterprise Edition customers use our Tasks feature rather than Reminders, which is Support Desk only. Tasks are an extension of Reminders and allows user to assign and manage Tasks for themselves and other users. The Tasks feature allows TeamSupport users to assign and track multiple Tasks for other users or themselves. This way a single person, like a Project Manager or a Ticket creator, can assign various Tasks out to other users at any time. Furthermore, you can create 1 layer of Subtasks for your main Task. This allows you to add further granularity and organization to your Tasks. There is not a limit to the number of Tasks or SubTasks that can be created. Tasks can be setup with Reminder Dates and Due Dates so that deadlines are not missed. An email will be sent to the assigned user on the reminder date and/or the due date. Followups: Set a reminder to followup with a Customer at a certain time/date. Approvals: Ask for approval on a Ticket or Product by assigning a Task to the Approvals User or Group. Documentation: If the result of a ticket means that your documentation should be updated, ensure this happens by creating a Task for your Documentation Group. RMAs: There are a number of steps required with Return Merchandise Authorizations. 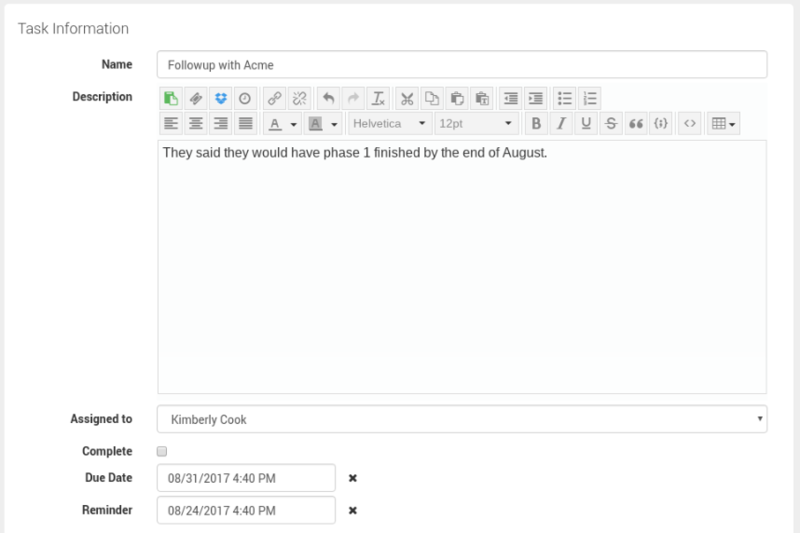 You can assign multiple Tasks out to multiple Users at once. Software Releases: If a bug is reported, there are multiple Users and Groups who would need to take action on a the ticket in order for it to be released. Orders: When a new order is created, this sets off a chain of events which can be handled by associating the Order to Customers and Products, and assigning to the appropriate Group and User. You can view the Tasks for tickets on the right hand side of the Ticket Detail window. You can also view and manage all of your Tasks from the Task section on the left hand navigation. To add a Task on a ticket, open a ticket and click “add” under the Task section on the right. The following form is displayed. Name is the only required field. The ticket will be auto associated to the Task. The field definitions are the same for Tasks with associations other than Tickets. Click here to see definitions for all Task fields.